Previous to the establishment of the current LVV authority card system in the early 1990s, the only fender exemption system - if you could call it that - was a letter of exemption that could be issued by the Ministry of Transport (MOT) or the NZ Police, that allowed a specified vehicle user to operate the motor vehicle referred to in the letter without mudguards, subject to certain conditions. The exemption was not restricted to users of any group or membership type, but it limited the use of the vehicle to such an extent that it was illegal to operate the vehicle for any purpose other than traveling to and from bonafide hot rod club events, and for repairs to keep the vehicle roadworthy. At the time that we began the negotiations to establish what we now know as the low volume vehicle certification system with the Ministry of Transport in 1989, the NZ Police and the MOT were aware of wide-spread abuse of the exemption letters, principally that the vehicles were being used for much more than just to and from legitimate hot rod club event activities. The exemption letter system had become considered to be too difficult for the Police and the MOT to monitor, and enforce compliance with, and the system therefore, was to be abolished, leaving rigid compliance with Regulation 76 of the 1976 Traffic Regulations. This regulation clearly stated that "No person shall operate a motor vehicle, unless . it is fitted with a mudguard over each road wheel". There's a bit in between that talks about "if it reasonable and practical to do so", but from the Government's point of view, it is entirely reasonable and practical for old cars to be fitted with mudguards, because that's how they were originally manufactured. At the time - around 1991 - NZHRA was leading the way with negotiating with the MOT toward what would become the LVV certification system (as an alternative to the then-proposed Australian Design Rules and Transport Engineers) and had developed a very good relationship with, and had gained considerable credibility with, the MOT. 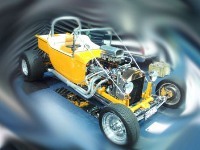 Aware of the difficulties of the fender exemption system of the day, and the intention to close down the ability for genuine enthusiasts to build and drive traditional hot rods, NZHRA entered into additional negotiations with the MOT to gain consideration of an alternative system, rather than scrap the system in its entirety. NZHRA worked to enable the Government officials concerned to gain an appreciation of the historical significance of traditional hot rods that were typically built by returned servicemen throughout the world during the late 1940s and 1950s, and stressed the importance of not losing this important motoring tradition within New Zealand. There were, are now, and always will be, hot rod enthusiasts who wish to build and drive traditional 1940s-1960s era hot rods, many of which are fenderless. These cars are a direct link to the hobby's roots, and it is vital that the ability to continue to build and drive such vehicles is maintained, so that future generations will always be able to see and enjoy hot rodding's heritage in just the same way that it is important that New Zealand's 19th century architecture is preserved to show us what our country looked like 150 years ago. For this reason, NZHRA now awards the highly-coveted 'Best Traditional Hot Rod' award at all national events to recognize excellence in the build of this style of car. While the NZHRA log book system is an annoyance to some, it is necessary to operate log books in order to enable people to continue to build cars to compete for these awards, whilst minimizing the risk of abuse of the system. But back to the problem of 1991. In order to resolve the monitoring and enforcement issues that the Government was experiencing with the mudguard exemption letter problem, NZHRA proposed that the national hierarchal structure of NZHRA could achieve the desired results for all parties, and without any resources being required from the Government. NZHRA was (and still is) in a unique situation in NZ, in that it has a national executive committee, a network of member clubs throughout the country, and in essence, 'area managers' in the form of the Executive Committee members who form a direct link between the member clubs and the national association. The structure is set up in such a way that an individual must belong to an NZHRA member club in order to belong to NZHRA, and the member clubs' own internal management structures create a unique situation where the actions of each individual member in the country is effectively overseen at a local level by the member club committees, in turn providing a monitoring and reporting function back to NZHRA at a national level. NZHRA proposed a system whereby NZHRA would issue a fender exemption 'authority card' to members (and vehicles) who met a specified criteria, provided that its member clubs undertook the role of endorsing the character of its member and supported (in writing) the application, and then took responsibility for each member it supported by monitoring the behaviour of each member. This would ensure that the system, and the hobby, was not bought into disrepute with the accompanying risk of jeopardizing the future of the fender exemption authority card system. Each authority card would be renewed annually, and the member clubs could, and would be expected to, revoke their endorsement of any member who operated outside of the conditions established by NZHRA. A national structure and network would, therefore, vet each application, and monitor the behaviour of each authority card holder on an ongoing basis. It was thought that this structure could give the Government the necessary confidence that an outside organisation could in fact take responsibility for such a job, and do it well. The system was proposed, accepted in principle, developed, and agreed in legislation through the Land Transport Compliance Rule. It has proven to work very well, with NZHRA and its member clubs taking the situation seriously and doing an excellent job - an obvious outcome given that the ability to continue to have such a system depends entirely on NZHRA's performance in administering it. In other words, NZHRA and its members have everything to lose if they screw up, therefore the job gets done well. The legal mechanism that gives the system its legal standing is in paragraph 2.4(7)(e) of the Land Transport Vehicle Equipment Rule 2004 (Rule 32017), which states that the only vehicles that can be legally operated without mudguards (apart from a vehicle on a trade plate, a straddle truck or a forklift etc) is "...a motor vehicle for which a valid low volume vehicle authority card has been issued for the vehicle and its operator in accordance with the Low Volume Vehicle Code." In turn, Annex 3 (Specific purposes covered by a LVV authority card) of the Low Volume Vehicle Code authorises the NZHRA card system by stating "Compliance with Chapter 3, LVV authority card, under the New Zealand Car Construction Manual (CCM) of the New Zealand Hot Rod Association (Inc), covering only those components and systems that do not comply with applicable requirements for general use on the road and valid for a maximum period of 12 months only". Then in turn again, Chapter 3 of the CCM specifies the eligibility criteria that must be met. Essentially, the LVV authority card system administered by NZHRA to enable fenderless hot rods to be built and driven is a means by which certain people are able to drive certain types of vehicles that feature certain characteristics which would otherwise be prohibited by law - and for good reason. So, in summary, it's important to understand and remember that its not so much that one has to be a member of NZHRA to have a fender exemption; - what has to be understood and remembered is that this is the only mechanism by which the Government can be assured that certain vehicles which would ordinarily not be allowed on New Zealand roads, can in fact continue to be built and driven despite having characteristics that would ordinarily make them illegal. The clear national structure, heirachy, conditions, and checking processes enable sufficient control systems to be put in place that the Government has learned to develop confidence in, over a long period of time. In other words, it's not so much a question of 'this system or another system', but rather a question of 'this system or no system at all'. This whole issue also has to be considered within the context of the time, and the country we live in. New Zealand, in the 21st century is - like it or not - increasingly safety-conscious, environment-conscious, and unwilling to allow people to take responsibility for their own actions. There are increasingly greater expectations of vehicle safety for vehicle occupants, other road users, and pedestrians. I'm not saying that I like it or agree with it, but that's how it is. None of us can change that. We all have to recognize that - and none more-so than those who grizzle about the details of the NZHRA fender exemption system - it's not 1960 anymore. Understand it. Accept it. Get over it. We have a system that allows us to build and drive traditional hot rods - with few restrictions of use. Be happy with the few small inconveniences, or accept the alternative - no fender exemption system at all. Support NZHRA's efforts and work with them, not against them, so that we can all enjoy this privilege - let me emphasise that word 'privilege' (because if you think driving a fenderless hot rod in 21st century New Zealand is a 'right', then you belong in the dark ages) - for many years to come.